​Ashu is a demonstration that good things come in small packages. 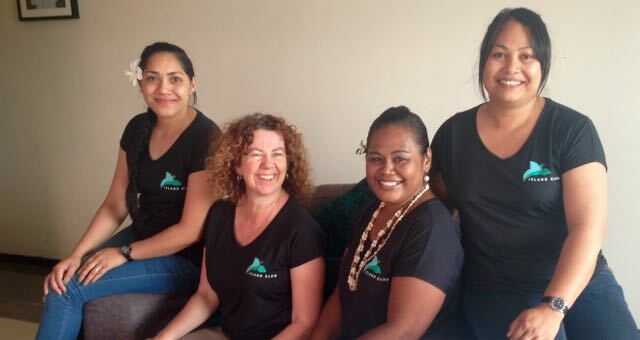 She is a dynamo of energy, and is highly experienced working in spas in Fiji, including the Intercontinental. The quality of Ashu's work in spa treatments and hair / make-up is evident in the enthusiasm of her clients. She is very talented with hair and make-up, bringing out the beauty in everyone and making sure that they shine. And her warmth and attention to detail make her massages and facials bliss. ​​Saane is our wonderful receptionist. You feel instantly relaxed with her warm smile and her welcoming ways, so your experience is great from the start. Saane can advise on treatments, bookings, and gift possibilities from our shop. She comes to Island Glow after many years in New Zealand, but we hope she continues to love Tonga! ​Sonia is the other director of the company. She does the work behind the scenes - financial management, marketing, HR, and design work. She has a day job as an environmental consultant, so the spa industry has been a steep learning curve. Luckily she loves a challenge. Sonia has lived in Tonga for about 8 years out of the last 11, and has definitely found a second home here in Tonga. Fa and Sonia met in Tonga in 2005. Over time they discovered they shared many parallels in life, and became close friends. They have travelled together and shared many aspects of life's journey. As part of this, they often shared ideas about the future. One of these was to start a business, making traditional Tongan beauty products in a contemporary context. This idea grew to combine creation of high quality beauty products with the operation of a day spa. After some years of talking and dreaming, Island Glow opened for business on March 8th 2016.